The point to remember is that the distance from the center of the diagram to one of the points on the “outline” corresponds to a luminous intensity value, often in candelas, in the given direction. 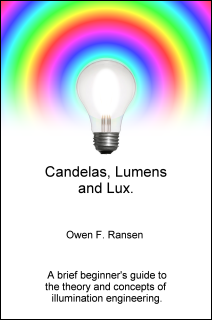 These diagrams tell you immediately if most of the flux (the lumens, the “flow of light”) goes upwards downwards or sideways. In the example opposite all the light flows in a downard direction. With C-Gamma photometries the gamma is the “elevation angle” and gamma=0.0 corresponds to a ray of light pointing downwards. The C angle, the angle of the “C-Plane” is usually represented as C=0 going off to the right along the positive x axis, and C=90 going along the positive y axis. The luminaire whose polar diagram is shown below therefore, shoots most of its flux “out to the left” and is symmetrical in the C90 - C270 plane. A concrete example might explain better the concept of C-Plane. If mounted inside a room, you could put the C0 plane pointing north, then the C180 would point south, and so on. The 3D view below should help you orient yourself. Remember though that this is the default positioning, the luminaire can be rotated and tilted in real life. The images below show you two different sorts of luminaires in a polar C-Gamma diagram. The first luminaire shoots all of its flux upwards, presumably it is used for indoor indirect lighting, when the light is first reflected by the ceiling before arriving at the worksurface. All the light is in the gamma = 90 to 180 degrees. The second luminaire shoots some of its flux upwards and some downwards, a “direct-indirect” method of lighting an indoor environment. The bigger the bulge the greater the intensity of the light along the the "bulge". Another photometric diagram is the VH diagram. This is used for floodlights, for luminaires that have to illuminate a large area. As in CGamma two angles are used as the coordinate system, V and H.
The immediate difference you see with this system is that it only covers half of a sphere. It is assumed that floodlights will never emit light away from the main beam. The VH system is generally shown “pointing horizontally”, but in practice the luminaires will often be directed down onto a sports field (or carpark) from a high pole. 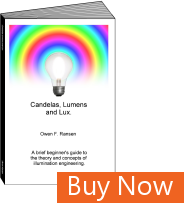 There is a complete explanation in "Candelas Lumens and Lux". Click here to buy the poster from Zazzle for $16.80. Contact me if you have any questions about this page or PhotoView photometric viewer. PhotoView is part of a set of services and programs from OxyTech which can be bought with a 10% discount. Click here to find out more.